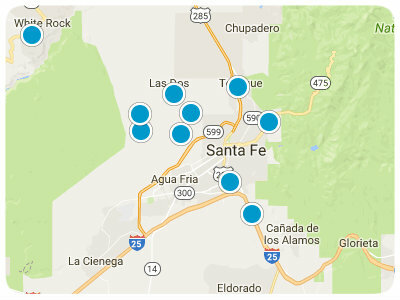 Nestled in the foothills of the southwestern base of the Sangre de Cristo Mountains, the Southeast Foothills area in New Mexico offers homebuyers plenty of wonderful options. The famed Old Santa Fe Trail runs through this area, and the fantastic community of Canada de Los Alamos is directly adjacent to the Santa Fe National Forest. Available properties in Canada de Los Alamos and the wider Southeast Foothills area include single-family homes, estates, and condos. Equestrian properties are also available. Because there is a wide variety of style and sizes among the real estate options, you are certain to find something that suits your preferences and budget. Homes for sale in the Old Santa Fe Trail area are ready to impress you, so now is the time to consider what it would be like to live in this area. When you choose to live in this area, you will appreciate the plentiful entertainment opportunities that will surround you. For example, you may enjoy hiking or strolling in nearby parks and natural areas, such as Shaggy Peak in the Santa Fe National Forest. If you want a more metropolitan experience, then you can travel the short distance to vibrant Santa Fe. This city is an arts hub, so you will have numerous options to enjoy theater productions, artwork, musical performances, and much more. Fun local festivals and the outstanding Santa Fe Farmers Market are also excellent places to spend time. Whether you are hiking in a park or touring a museum, you will be content to think of your single-family home, estate, or condo in the Old Santa Fe Trail area awaiting your return. An unrivaled location, wonderful natural beauty, beautiful residences, and rich heritage are only a small sampling of what you will enjoy about being a resident of this area. Exquisite homes for sale in Canada de Los Alamos and the wider Southeast Hills, Santa Fe, area are ready to pique your interest, and you are sure to find something that suits your style. If you are ready for more information regarding Old Santa Fe Trail real estate options, please do not hesitate to contact us.